A fast-growing airport has revealed plans to build a second terminal as part of an ambitious expansion scheme. London Luton Airport Limited (LLAL) said its "preferred option" would be to build on Wigmore Valley Park, beyond the north of the runway. It hopes the expansion of the airport will see passenger numbers rise from 18million to 32million a year. The Transport Secretary will have the final say on the plan. LLAL said that to compensate for the expansion, it would provide new parkland further to the east. The company is expected to submit its final plan to the government by mid-2020. An initial consultation was launched last summer, and residents will be able to have their say in the autumn. Andy Malcolm, chairman of LLAL, said the airport was "a key driver for the success of the whole region" and the "two-terminal solution" would "form the basis for ongoing design work". "We have a unique opportunity as the owner of London Luton Airport to support growth of the local, sub-regional and national economies, and the council's transformation of our town," he said. "Our preferred option safeguards as much land as possible within Wigmore Valley Park, and provides a new footprint for the parkland and open space which is 10 per cent bigger." 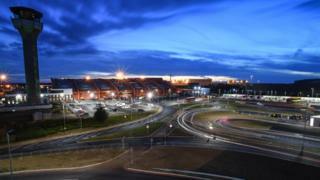 Luton is the fifth largest airport in the UK. It is expected to handle 17.7million passengers in 2019, and based on its current rate of growth, will reach its maximum permitted capacity of 18million by 2020.